Following the successful release of his inaugural solo album Ordinary Man and first-time showcase as a solo artist at Florida Music Festival, multi-talented founding member of the groundbreaking vocal band The Edge Effect, Solomon Jaye is excited to announce the official debut of his “Love You Now” music video. The catchy original track with some recognizable Jackie Wilson, Al Green and Otis Redding musical vibes is Jaye’s moving soul ballad and first single release. “Love You Now” music video is available at http://www.YouTube.com/SolomonJaye, and the track is available for purchase on iTunes, Google Play, CDBaby and more. With background vocalists Stephanie Lilly and Sarah Pigion, the song brings the rich girl, poor boy love story to life. The video is directed and produced by Cesar O. Perez (for Bluemoon Filmworks) and choreographed by Jaye. Keandra Cordero, Alexandria Thomas and Madison Gordon feature as the Supremes-inspired support dancers. Shot as a 70s-styled TV performance, Jaye shows off his impressive dance moves before the conclusion of the video. “Love You Now” is produced by an all-star team of industry veterans: Grammy Award winning engineer Clark Germain, producer Jamey Tate (Al Jarreau, Mindi Abair, David Benoit, David Pack), keyboards by Jeff Babko (“Jimmy Kimmel Live,” Frank Ocean, Jason Mraz), guitars by Justin Smith (“Mad Men,” “Wicked,” “Book of Mormon,” LA Philharmonic), bass by David Hughes (David Benoit, Chaka Khan, Melissa Etheridge), drums by Jamey Tate, trumpets by Rob Schaer and saxophones by Jeff Driskill. Talented singer, songwriter, tap dancer and ASCAP Member and GRAMMY Voting Member (N.A.R.A.S.) Solomon Jaye has over a decade of distinguished musical highlights, including performing with winners of MTV’s “Top Pop Group,” Boyz II Men's "Next Great A Cappella Group" and “America's Got Talent” finalists The Edge Effect, premiering a solo show on the world’s largest cruise ship Oasis of the Seas, taking center stage in “Hairspray: The Musical” for Royal Caribbean, opening for Jessie J. & MKTO at FIU as well as Robin Thicke and Sky Blue (LMFAO) at the Florida SunFest Music Festival, sharing the stage with Broadway superstar Shoshana Bean, renowned saxophonist Mindi Abair, Las Vegas’ Santa Fe and the Fat City Horns and many more. 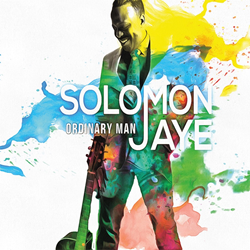 For more news and information on Solomon Jaye, visit http://www.solomonjaye.com and http://www.facebook.com/sjmusic.